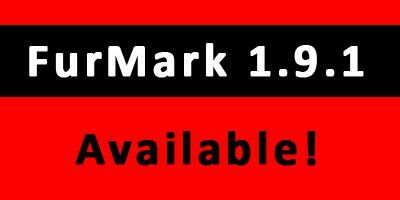 FurMark, the popular GPU burn-in utility, is, at last, available in version 1.9.0. Webmasters: hotlinking is not allowed (it will cause an error message), please use the post url as download link. Remark: some strings are not translated: they will be fixed in the next update of FurMark. You can also download FurMark 1.9.0 from FilePlanet. – and all other models I forget. Okay, now let’s see the new features of FurMark 1.9.0. The graphics workload is heavier than in FurMark 1.8.2 to follow the GPU power processing of recent graphics cards. For example, a GTX 480 has a score of 6478 points (108FPS) in FurMark 1.8.2 in 1920×1080 while in FurMark 1.9.0 the score of the same card is only 1769 points (29FPS). FurMark 1.9.0 adds a dynamic background instead of an static image. But don’t panic, this is an option, and if you want to find your favorite dragon, just uncheck the dynamic background. I also added a mode with two interlaced furry torus and a moving camera. Preset:1080 : 1920×1080 fullscreen, no AA, Post FX disabled, dynamic background, burn-in enabled. Preset:720 : 1280×720 fullscreen, no AA, Post FX disabled, dynamic background, burn-in enabled. Two GPU monitoring utilities are now embedded in FurMark: GPU-Z and GPU Shark. For GPU-Z, I added the option to disable the OCP (over current protection) on GeForce GTX 500 cards. OCP is not available on every GeForce GTX 500. For example, OCP is actived on EVGA GTX 580, while this protection has been disabled by ASUS on its GTX 560 Ti DC2. As soon as the GPU temperature exceeds the max value, an atomic alert siren will be played. Another important change is related to spikes in GPU temperature monitoring. These spikes occur when several monitoring utilities try to access to the same hardware at the same time. FurMark 1.9.0 includes a spike filtering module that clamps spikes when difference between two consecutive temperature exceed a threashold. 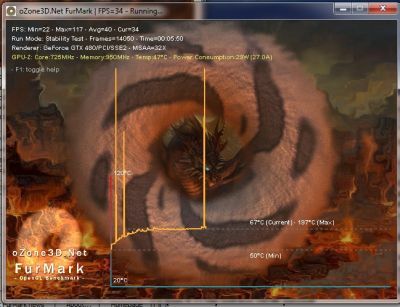 FurMark is an OpenGL-based GPU stress test utility. It makes it possible to push the GPU to the max in order to test the stability of the graphics card (and the PSU too!) leading to maximal GPU and VRM temperatures. That’s why FurMark is often used by overclockers and graphics cards fanatics to validate an overclocking, to test a new VGA cooler or to check the max power consumption of a video card. New: added /gtx500ocp checkbox for GPU-Z to disable GTX 500 OCP (over current protection). New: GPU-Z 0.5.1 and GPU Shark 0.4.1 are now embedded in FurMark. 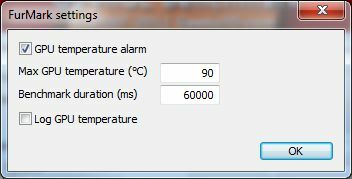 New: added programmble GPU temperature alarm. When GPU temperature exceeds a threshold, an alarm sound is played. New: added warming-up step to benchmarking. New: improved OSD (on-screen display data) readability (key V). New: added GPU monitoring in 3D window. New: added GPU-Z full GPU power consumption data (power, voltage and current) if available. New: caution message displayed before every burn-in test. New: score submission is now limited to two presets: Preset:1080 and Preset:720. New: added animated background image option based on iq’s code. 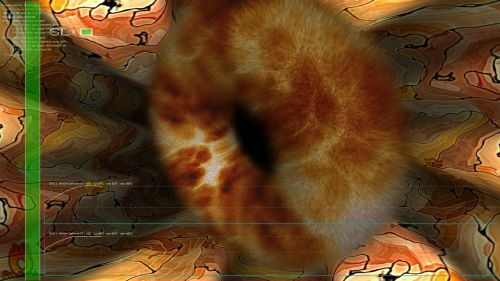 New: added animated camera option with multiple furry torus. Bugfix: spikes in temperature graphs are now filtered. I’d like to thank ASUS, Corsair and Sapphire for their hardware support. Were you to scared to stick v2.0 on this? I like the new Furmark title picture, very funky. Also isn’t it about time you added support for NVAPI so that SLI is automatic? Save people messing with SLI profiles. finally released! nice job JeGX..interface is great, new preset button are awesome…its much more streamlined than your beta..top effort! Remember to read the warnings that popup and be careful with your overclocks! EVGA OC Scanner is so much better than Furmark (and it uses an equivalent furry object). The best thing of OC Scanner is that it can count artifacts. @Licaon: thanks for the wine test! @Leith Bade: actually the v1.9.0 is ready for ages, and I use it since several months. Okay there are some new features but nothing that deverses a 2.x.x version. This excellent tool for testing cooler or GPU as you say, i have put Revoltec 9.2cm on side of the box to keep cool my passive HD4670 and it works. @Stan: actually FurMark 1.8.2 temp reading has an issue. FurMark 1.9.0 displays correct GPU temps. I just want to inform you that FurMark and FluidMark are now available with Linux/OSX thx to PlayOnLinux/PlayOnMac !! They both work great with wine and PoL/PoM except for une thing, you cannot close furmark or fluidmark, you must kill the process (probably wine related). Tested with wine-1.3.16. Also note that FurMark cannot read GPU temp (it display zero) probably because of something missing with wine or because probe are not used the same way with windows and Linux/OSX. @PoL_Fan: thanks! I’ll post a news shortly. •New: GPU-Z 0.5.1 and GPU Shark 0.4.1 are now embedded in FurMark. Furmark and Kombustor are reporting my GPU temp at over 47,000 degrees C!! While GPU-Z is reporting normal temps around 52.0 C. What could be the problem? Well, it seems one of them is lying. I have the same problem with my Packard Bell IXTREME X6618, which is running on INTEL core quad CPU Q8200 @ 2.33 GHZ – 4 GB Ram. When playing Grand Theft Auto 4, after 15 mins the pc just goes off, not shutting down but off right away. I downloaded some of the software mentioned above but still cannot understand what is happening, the thing is that with over 10 different programs running for hours it does not go off but when playing GTA 4 it does…can you help me out pls cause its frustrating !!! Can someone help me? My monitor has been turning off when I play a graphics demanding video game. So I beefed up all my case fans. Now I don’t crash, but my GPU (GeForce GTX 460) is still running around 85C-90C. It idles around 40-45C. I tried running a couple of these FurMark tests. A couple seconds in, my I crash and lose monitor. I’m running a 700 watt psu, so should be OK…plenty of airflow in the case. I am also not overclocking. Just overheats instantly…very similar to this guy’s youtube video – but I actually lose my screen. Just ran then benchmark, showed me that I need to renew the TiM, so tyvm. I wonder how my score is higher than someone with a 5850, maybe it’s just too early in the morning and I need more cofee. ie: I’m comparing apples to oranges and not reading it correctly. “someone with a GTX580” I meant, cannot edit, sorry.